This is what happened during the last 24 hours in my business: $12,040 CASH received in my bank account. I decided to reinvest it and more ($13,300) to create the tools and systems for a $250,000 year & business. Do you wanna know how to get paid $10,000 in cash with ONE piece of content? 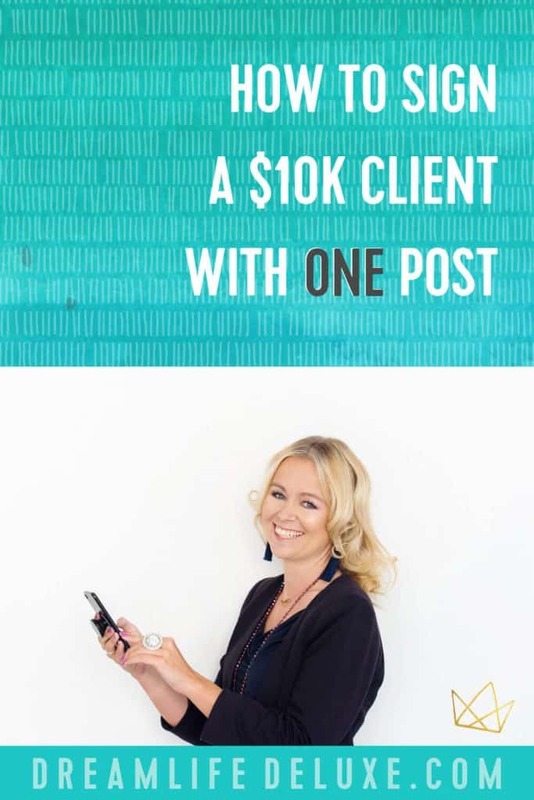 YES, I can find 10k clients with ONE empowering, super targeted and specific post. It has to speak to this ONE person – don’t worry about the rest! However, this post is NOT my very first post out there!!! My content from last month still works as well! When someone joins my Facebook group, they can literally binge watch my content! You will get to know me, can listen to HOURS of live videos, and will get a pretty good idea of my message, my values and how I help my clients to grow their business! That’s why you want to CREATE CREATE CREATE from the bottom the heart! Be yourself and get paid for being you! Your content positions you as an expert. Speaking of, if you want some extra help with visibility online and content, sign up below and get a free 4 day training . Check out the end of the this post for more info about what you’ll be learning each day. 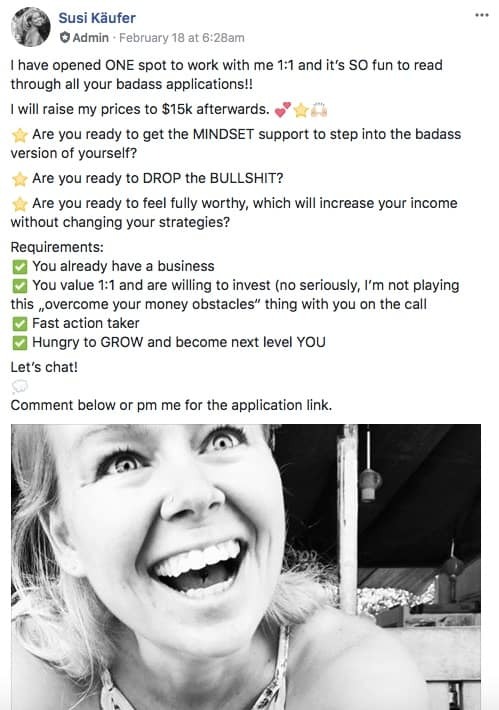 So after making clear that I’m not giving you a $10,000 post that you can just copy paste, here we go! As I know that’s what you wanna see! I typed this on my phone and it literally took 5 minutes. I love to use emojis. I love to make posts easy to read. I told people what I’m currently offering. Not kidding, most people don’t get results because they simply don’t DO this! I included a pretty good reason to take action NOW. I made clear who it’s for and what requirements you have to meet. I included a call to action. The exact questions to get a “Hell yes!” even before the call. How many hours of your life have you already spend on Discovery Calls that didn’t lead anywhere? Let me tell you I had my fair share of those. Because I simply though I should get on the phone with ANYONE who expresses their interest. I ain’t got time (and patience) TO DO this! Here’s how I make sure that I only get on a Discovery Call with people who are READY to work with me, know my prices and are willing to invest into my packages. What inspired you to apply for this opportunity? What are your main struggles right now? What do you think is currently holding you back from being at this point already? Why are you interested in working with Susi specifically? What makes us a great fit? Are you ready to invest in high-level coaching and mentorship? Why are you an amazing client to work with? If it's a perfect fit, when are you ready to get started working together? If I feel like it’s not a perfect fit or they click on “No, I do not have funds to commit right now” I don’t get on a call with them. THAT sounds like your perfect ideal client! Become an energetic match for what you WANT! It’s your responsibility to SHIFT out of this! No-one wants to invest into someone seeing them as a “problem, concern or sack full of money”. Expect the best and vision how amazingly well things will go! by journaling my “ideal vision” of what I want to happen. With exactly THIS confidence, conviction and honest joy I get on my calls with people. And it always does it’s magic! When I was just starting out, I was using a script. Horrible!! The conversation doesn’t flow, it’s “unnatural” and you’re just behaving like a scaredy cat trying to be perfect. The purpose of this call is to find out if we are a perfect match! Tell me where you've learned this specific skill you've mentioned in your questionnaire? What kind of support do you currently have in your business? How do your struggles with mindset and confidence currently affect your life and your business? How can you break through this vicious circle? What have you tried before that didn't work? Do you have ANY questions about the program or my coaching style? Awesome. Would you like to pay in full or do you want me to explain the payment plan I have? Great. Would you rather pay via PayPal or Credit Card? That’s it. Now PLEASE don’t try to use this as a script, it won’t work!! All I literally did, was ask things I was curious to know. I didn’t prepare these questions, they just happen to flow when you trust yourself to guide the conversation and have an honest interest in your potential client. Now here’s what I did after the call. Manage the funds. I usually like to withdraw large amounts from PayPal right away (do you know the story of my account being frozen?!) and afterward I transfer the funds based on the financial plan I’ve mapped out in my mindset journal. Team, taxes, investments in my business, savings, a small budget to simply celebrate. How much do I reinvest? 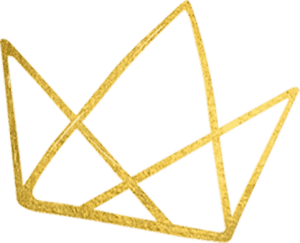 Now – this really depends on my overall vision for the NEXT LEVEL of my business. What’s currently MISSING to triple my yearly income in my business? This can be a business coach, a copywriter or a web designer. So on the very same day, I hired a new sales funnel team on a 6-month contract and reinvested 100% of my monthly income, to create the tools and automations I need to create a $250,000 per year business. The right next step for me to move forward? YES! What’s YOUR next step to move forward? I was thinking of creating a freebie out of this to grow my email list but decided against it. If you found this helpful, please gimme a SHARE this one time! Do you wanna grab my EXACT visibility strategy to achieve all this? Get my FREE 4-day training! Just drop in your name and email below to get started right away. I found you while pinning ‘Lady Boss’ pins to one of my boards. I absolutely can’t afford your services at present as I’m just starting out BUT I can see the benefit once I get some traction. I love your post about the $10k client. I have clicked on the photo for your 4 Day Visibility Training but it’s not opening anything. Is it still available?? I was pinning to the #girlbosstips group board that I am part of and found this! Love how simple this post is and straight to the point!